This chapter is committed on discussing a number of bankruptcy concerns affecting the smooth functioning of a residential mortgage-backed securitisation programme. 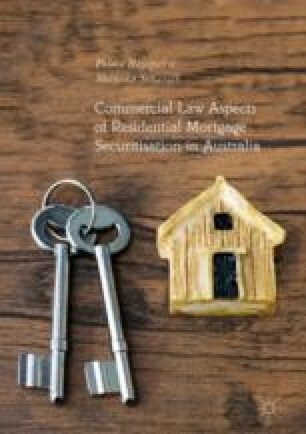 The initial focus of the chapter is on identifying the consequences of the originator’s bankruptcy on a residential mortgage-backed securitisation scheme in Australia. Then, the chapter moves on to investigate threats posed by the trustee-issuer’s insolvency. This discussion is two-fold. On the one hand, the discussion emphasises the trustee-issuer’s insolvency as the trustee and on the other hand the insolvency of the special purpose vehicle (SPV) in the capacity of the issuer. Finally, the chapter engages in a discussion on a number of means adopted by Australian securitisation programmes with the idea of minimising negatives on a securitisation programme imposed by the bankruptcy of its stakeholders.